Furnace smells are almost always a sign of a problem, either in your furnace ducts or inside the furnace itself. A burnt rubber smell is actually fairly common, especially if you have a combustible furnace. The smell does not necessarily mean rubber is burning, but it does mean something is probably getting too hot. Sometimes furnaces simply smell for a brief time when they are used after a long break. The burnt rubber smell can also indicate more serious issues. A burning smell can indicate several problems with a furnace. Dust can settle in your furnace, on your fan blades, on your firebox and in your ductwork. When your furnace starts to produce heat, it can burn this dust and then send it out through the ductwork into your home. The result is a lingering smell that may resemble burnt rubber but isn't serious. Fix this problem by wiping down all the surfaces in and near your furnace. If you have an oil furnace, there is a chance that some of the oil is leaking or escaping from the nozzle and is being burnt outside of the firebox. This burnt oily smell can also resemble rubber and is an indication of a more serious problem. Lubricant oils and similar products can also create this smell, even with a gas or electrical furnace. The smell may also be a sign of burner issues. If your burners become partially clogged or dirty, they can burn poorly, building up more contaminants and then frying them in the heat, until the smell escapes. This can lead to a burnt smell around your furnace unit. If the air supply to the burners is cut off, the flame may become more smoky and a smell may be more noticeable at these times as well. 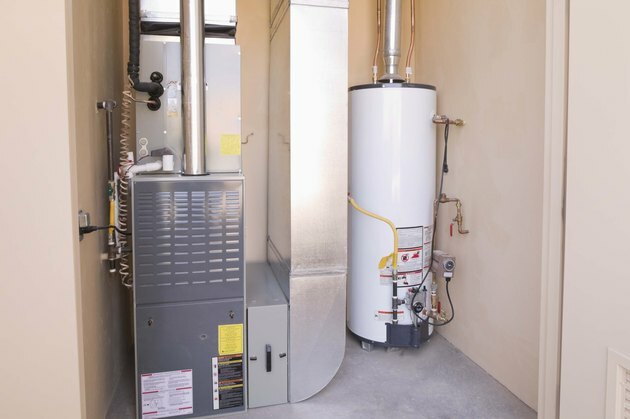 In some cases, what you are smelling may actually be leaking gas from a gas furnace. A problem with the line or the gas valves may allow gas to escape. Natural gas is laced with chemicals that can give off a strange, burnt or sulfurous odor. This is an extremely serious problem and requires evacuation and immediate attention, but it is also a relatively rare case of smells, and easily isolated to the gas line itself. What Causes Home Radiator Odors? Why Does Cedar Wood Pop?